What are The True Words of our Creator? Where Is The Untouched Message of The Almighty Creator? What Is The True Religion of our Creator? We have only one Creator, but we came up with nearly 4200 different religions! Do you think our loving Creator has sent His prophets with different messages to different corners of the world in order for us to have dispute with one another, and kill each other in the name of religion? Don't you think that would make our Creator a wicked creator? Therefore, something is wrong! The only information we have from our Creator is written in His scriptures delivered to us by His Prophets. So let us study them. But, we know through the years the texts of these scriptures have been lost or have been distorted. Then, we must find out which one of them is closer to the truth or may be untouched. Of the major scriptures in the world, we have now three widely influential documents: the Torah or the Old Testament, the Bible or the New Testament, and the Arabic Quran, the Final Testament. Through the years, these scriptures were translated, and distorted, and copied repeatedly, at first by hand, until they have finally come into our hands. But, each one of them has different rules and regulations, simply because of the translator's different opinions and interpretations, or they were distorted for the benefit of religious leaders, or basically some parts of them were lost through the time. Translators fear their wives, children, friends, families, and other people in society therefore; they can never ever translate the true words of the Almighty Creator from the scriptures for other people. But, our Creator does not fear any body, and He will always speak the truth. Above all, The Almighty is the Only Teacher of the Scriptures, and not the translators. So if someone translates the scriptures for other people, it appears that he is interfering with our Creator's work, and he would bring another scripture besides the Almighty's scripture! Another words they are hiding the true words of our Creator. That is why we are all arguing and fighting with each other over our so called religions. Through the years we have been following the religious leaders thinking that they know about our Creator's religion. The reason is because humans have a tendency to follow the crowds. You must have seen stampede of people on black Fridays or any sudden reaction in a crowed in news media. We react just like herd of cattle. They say we follow like sheep, but sheep are one step ahead of us, because they have sheepdog, who directs them. Some people have found out about this human weakness long time ago, and they took advantage of us. That is how we have been witnessing them here and there, who were controlling other people. They use this weakness of human trait in revolution, religions, politics, advertisings, and so on. And then those so called religious people wear especial outfits, so they could be recognized by followers. Therefore, majority of us are called the average people. But, you Do Not want to be among the average people. This is so fascinating, if we are by ourselves, we would stand up as an individual to confront anything. But, if we are put within the crowed, we would just follow the others. It is like we lose our intelligence, and brains, when we are put into the crowed, and we become blind. That is how this phrase came about, "Following others blindly". That is why throughout the history we have been cheated, and fooled many times. Then after twenty or fifty years we have found out, what really happened to us. Now, that we have found out a little bit better about ourselves, then why not we start to analyze things by ourselves individually, instead of following our leaders blindly, because, religion is a covenant between a man and his Creator. So we must be worry about our own neck. You must clear your mind and truly desire to know our Creator, and His system. You must put aside any jealousy and being prejudice in order to find the truth. Through our life we have been fed information about religion by those so called religious people, because we have been following them blindly. That is why these so called religious leaders have millions of followers. You can hardly find individuals who researched on religion by themselves. Yet we study so many different books for so many years in order to get some degrees, so we can feed ourselves. But, we must know that the Almighty guarantees happiness in this life, and the life after here. Do you know why? Because, we have been created weak, and we are not able to know the future, and we cannot control other people. Therefore, we are not able to make ourselves, happy. Simply our Creator is the only one who could protect us. And we have our whole life time to learn about the Almighty's religion. They say if you study on a subject about 10 or 20 minutes a day, after 10 years you would become a professional in that subject. The most logical way possible is to put aside whatever you have heard of religion before, and leave those so called religious leaders alone, and get rid of those translations, and try to discover the true religion of our Creator by yourself. As I mentioned we have three widely influential scriptures. But these books have been distorted and translated so many times throughout the history. Therefore, we have to find out which one is closer to the truth, or untouched. Because, each one of them has a different rituals. The Torah or the Old Testament was revealed through Prophet Moses, in Hebrew language, when he was summoned by our Creator for 40 nights, while Torah was being written for him during those 40 nights. Then later on from that fully detailed scripture containing the lights from our Creator, they picked only 10 verses and called it 10 commandments, and forgot about the rest of those knowledge. And they turned the religion of the Almighty into traditions and customs. And because it is the oldest scripture, therefore, it was distorted much more than the others. As you might have heard, few years back they found the Dead Sea Scrolls in some caves around the Dead Sea areas in Jordan, in 1947. After deciphering it, they found out that it is different with the Torah that we have today. Therefore, they put it aside because; it would disturb the religious leaders. Then there is the Bible or the New Testament. Did you know that for 200 years after Jesus we do not find any information in history about the Bible? And after 200 years people wrote down the Bible by their own hands, and they said, "Holy Spirit revealed to us!" That is why we have so many different Bibles, and there are 167 different churches in US alone. Therefore, the true Bible is hidden in somewhere! And then there is the Arabic Quran or Final Testament, obviously in Arabic language. Prophet Mohammad's soul was summoned in High Heaven and the Almighty creator revealed the Arabic Quran into his heart as one revelation. Then later, on earth, the Holy Spirit was reading the Arabic Quran to him little by little, with instructions as which verse goes were in the Quran, and he was writing them down with his own hand, within the period of 23 years. Then right after his departure, his followers added 2 verses at the end of chapter 9 in order to idolize him, and they massacred the ones who opposed this horrendous crime, and they burned the original Arabic Quran, which Prophet Mohammad wrote it down with his own hand. Therefore, we have been deprived from the true Arabic Quran ever since, until 1974. As we are all witnessing in our societies, In order to measure the authenticity of any subject matter we seek its scientifically proves. And mathematic is the exact science among other sciences. Well, ever since 1968, The Almighty, Creator has been sending us a heavy mathematical signs in the Arabic Quran through two of our well known American Scientists, Dr. Rashad Khalifa, Biochemist, (Mathematical signs based on number 19), and Dr. AliReza Fazely, Physicist (Ultimate Mathematics), and also Mr. Milan Sulc, a Mathematician. Please pay attention: All references to so called Islam or Muslims in News Media, and other forums have nothing to do with the Arabic Quran. This Final Testament came down for all the people in the world, who seek protection for themselves, regardless of their race and nationalities. The Arabic Quran comes with specific sets of dietary instructions to protect you in this life, and teaches you how to get back to our creator in perfect security. Now that you have studied the Mathematical signs in the Arabic Quran, and its authenticity has been proven to you, then let me share with you my 40 years of searching and researching for the true religion of the Almighty Creator. I must tell you that people all around the world have been investigating and testing all of those Quranic scientific reports for the past 40 years, and they have not found any flaw in them. Our Creator challenges all the people in the world to bring only one chapter like the chapters in the Quran. The Arabic Quran has been written with Excellent Literary composition plus mathematical composition which interlocks this awesome scripture from inside, because the Almighty made it with His own knowledge. That means if you take away or add any letter, or any number to or from the Arabic Quran it is going to be exposed. Which One Of These Religions Is The True Religion Of our Creator? Judaism, Buddhism, Hinduism, Christianity, Islam, or . . .? "Here is the Religion Whistleblower"
By studying all of those scriptures, we find out about this shocking news that around 4000 years ago, the Almighty made the covenant with Ebrahim, and then after Ebrahim He has been sending His prophets, in order to repeat the same covenant for different nations of the world. And He commanded them all to follow from "The Nation of Ebrahim", "Submission." But, after those prophet's departure, we forgot about our Creator, and His covenants, and we started to worship those prophets, instead of worshiping The Almighty Creator. That is why we came up with 4200 false, fake, and manmade religions. Therefore, any religion's names come into your mind rather than "Submission" or "The Nation of Ebrahim", like, Judaism, Buddhism, Hinduism, and all the other isms, Christianity, Islam, and the other 4200 fake names, are all false, and manmade religions, which satan made us believe in them. You would not find any of these names in the original languages of those scriptures, in Hebrew, Aramaic, and the Arabic language. Remember satan was the one, who caused us to be naked, and caused us to be kicked out of the Garden. That is the Horrendous Crime of the Humanity against our Creator's only One Religion. The only religion accepted by the Almighty, is to follow from "The Nation of Ebrahim", "Submission", "The Sons will be Transported by the All Powerful". "Submission" is the only religion of all the creatures in 7 universes, everything we see, and we do not see. Then after Ebrahim's grandson, the Almighty called them, "Esra Eel". Once again satan fooled those translators, and ordered them to translate "Bani Esra Eel," as "The children of Israel". But, again if you check in the Torah in Hebrew language, you would find out, that "Bani," means, "Sons", and "Esra," means, "Transporting, and Moving," and the word, "Eel", means, "The All Powerful, The All Strong". Therefore, that means, "The sons will be transported by the All Powerful," from the time of Ebrahim to the end of the world. Therefore, "Israel," IS NOT the name of a place, yet it is the name of a Nation. That is how satan made us confused! satan confused the ones who call themselves "Jews," and fooled them and appeared to them over the courses of history that "Israel" was a name of a place! That is why few years back so called "Jews" invaded the Palestine, and called it "Israel", only because of their confusion about the word, "Israel". And ever since, they have been bringing disasters upon themselves and the whole Middle Eastern countries. Look, this is so simple. Ebrahim prayed for a son, and the Almighty answered his prayer, and gave him a son named, "Esma-Eel," that means, "The All Powerful, Hears." Then later on Angels gave him a good news of another son. His wife was standing, and she bashed, and slapped, her face, when she heard the news. because of their old ages. Then the Angels said, his name should be, "Es howgh," which means, "Banged, or, Bashed", And from "Es howgh," there would be another son, named, "Ya ghoub," which means, "The one after," or "Heel," meaning, "The Base". From then on, our Creator called them "Esra Eel." that means, "The All Powerful will Transport", "Ya ghoub's" 12 sons, and their descendants up to now, and to the end of the world. Just Like the name Zacharias' wife, "Eel Sa baa," that means, "The All Powerful 7," and now, we call her, "Elizabeth". Therefore, "Esra Eel" is NOT the name of a place, yet it means "The All Powerful will Transport". satan is doing his outmost to confuse us. Look at the Torah and the Bible, he took out the name of our Creator from both of those scriptures. This is unbelievable, and we are following him. And then he came up with "Jehovah", a fabricated name for the Almighty. In the original language of the Torah in Hebrew, it says, "Ya Ho Va", which means, "O' He". This is absurd. Few hundred years ago Germans came up with the name "God". Yet God is not the name of our Creator. If you study those scriptures in their original languages, you would find out, that our Creator calls Himself, as, "Eilah" or, "Al Eilah", which is, "The Eilah", or, "Allah". Yet satan took "Allah's" name out of those scriptures, except the Arabic Quran. But, now we have the scientifically proven scripture, supported by mathematics, the exact science, and the name of "Allah" has been repeated in the Arabic Quran, 2698 times which is divisible by the number 19, the secret code of the Arabic Quran, which is 19x142. And if we add the verse numbers wherever the word "Allah" occurs, the total would be 118123 which is 19x6217. For more information about the name of our Creator please click Here. Then, satan translated all of the names in those scriptures. Like, Jacob, Jonah, Jesus, John, Joseph, and others. All meaningless. Just like no one knows where the word "Jesus" came from. His name was "Iesous" in the original Bible in Aramaic language. And in the Arabic Quran is "E-saw" which is very close to his Aramaic name. The word "E-saw" comes from the root word "Sue-a" meaning "The Hour, Clock". And in the Arabic Quran the name "E-saw" is a sign for unveiling "The End of the World". Therefore, the name "Jesus" is a wrong name, and it should be "E-saw" as in the old Aramaic language. And also as in the Arabic language. So, people are using a name that is totally fake and manmade. Then, the name, "Bible" is a made up name as well, and its original name is "En jeal", meaning "Based on Purity". Thank Allah for the purified Arabic Quran based on mathematics, the exact science. Now, satan's descendent on earth called "Jinn". It seems like in jinns language, they are not able to pronounce the letter, "Y", and instead of "Y" they say, "J". Therefore, he changed all of those "Ys" to "J", which is his initial. Because, all of those names in Aramaic, Hebrew, and Arabic language pronounce the same. Like, Ya ghoub, Youness, E-saw, Yah ya, and Yousef. After Prophet Hud, some people started to idolize him, and call themselves "Ya houd" or "Hudean" or "Judean" instead of "Submitters". And now they are called "Jewish" which no one knows where this name came from. Then after Jesus or E-saw son of Maryam, some people started to idolize E-saw, and picked the name "Helpers", which in Arabic language, and Aramaic, is, "Nasrawni", instead of following "The Nation of Ebrahim", which Allah commanded E-saw to follow from. Just because once E-saw asked his followers, "Who are my Helpers? and the disciples answered, "We are your Helpers (Nasara)". And then later on his followers, disciples, they changed the religion of "Submission" into "Helpers", (Nasrawni) and then some other names, and then the Disciples turned to Monks themselves, and now we call them "Christians" which no one knows where this name came from either. So we divided the only religion of Allah, "Submission" into 4200 different false and fake religions, and each one of them follows from different rules and regulations. This is the Horrendous Crime of the humanity against Allah's system. In scientifically proven Arabic Quran, Allah never calls them as religion, but He calls them as "Parties" and there is a chapter by this name in the Arabic Quran, called "Al-Ahzab". Like democratic or republican parties. "The only religion accepted by Allah is "Following from The Nation of Ebrahim", "Submission", "The Sons will be transported by the All Powerful". (Genesis 17-19) Ebrahim will surely become a great and mighty Nation, and in him All the Nations of the Earth will be blessed. For I have chosen him, so that he may command his children and his household after him to keep the path of Lord by doing righteousness and justice. (Genesis 17:5) Neither shall your name any more be called Abram, but your name shall be Ebrahim; for a father of many Nations have I made you. (Genesis. 11:26, 31; 17:5) A prophet of the Lord, Ebrahim, with who Lord made Eternal Covenants, through which all the Nations of the earth are blessed. (Quran 6:161) Allah tells Mohammad to Say, "My Lord has guided me in a straight path - the eternal religion of Nation of Ebrahim, monotheism. He never was an idol worshiper." (Quran 4:125) And who has a better religion than one who submits his face totally to Allah, leads a righteous life, and follow the Nation of Ebrahim: Monotheism and Allah has chosen Ebrahim as a beloved friend. (Quran 2:130) Who would forsake the religion of Ebrahim, except the one who FOOLS his own soul? We have chosen him in this world, and in the Hereafter he will be with the righteous. Therefore, these people who call themselves, Muslim, Shia, Sunni, Hanbaly, Hanafy, Ismaiely, and others, according to Allah, they are all just Fooling themselves! So as Judaism, Buddhism, Hinduism, Christianity, and 4200 other fake, false and manmade religions. Wake up people. satan has done a good job so far, and made us all confused! As you know there are fabricated books "Mishnah" and "Gemarah" meaning what Moosaw said, and what Moosaw did. Then there are those fabricated books of "What Jesus said, and what "Jesus did". Then we have "Hadith", "Sunna", Sharia Law", and "Resalah". Meaning what Mohammad said, and what Mohammad did". Therefore, instead of following Allah, we have been following from those fabricated satanic books. Who cares, what Moo saw said, or, E-saw said, or what Mohammad said, or what, you say, and what I say. We want to know what our Creator says, because He is the only One Who can save us. "Allah has favored the believers when He raised among their midst a messenger from among them, to recite for them Allah's revelations, and to purify them, and to teach them the literacy and Hikmah (Especial knowledge from the scriptures). Before this, they had gone totally astray". This verse was repeated 5 times in the Arabic Quran, referring to all those 5 scriptures, which Allah gave to His prophets. Book of Ebrahim, Torat, Psalm, En jeal, and the Arabic Quran. Now people took this verse as if those Prophets were the purifiers, and teachers, so they can teach them how to read, and write and also teach them the Hikmah. That is why all of those fake religions are calling those Prophets, as their teachers. And there are 5 other verses that says, only Allah is the One Who purifies and Cleans us. If we want to be cleansed, we should ask Allah to purify us, give us the Hikmat, by studying the Arabic Quran constantly. If you take those verses as "The messengers would be the ones who Teach us and Purify us", then when there is no messenger among us, we should all be destined for Hell fire! . . . That means no one is deserved to study Allah's Arabic Quran in order to learn, and be purify, and receive Hikmah. Also it proves that we should not Follow from those Fabricated books, written by human devil. But the verse says, messengers only read to them Allah's revelations, and then Allah, and His revelations are going to purify them, and teach them literacy and Hikmah. That is how they fabricated those books from those verses, off course with the help of satan, who else? satan made a covenant with Allah, that he is going to mislead us, and he has done a good job so far. This is how easily one could fall in to an idol worship. First of all it says, that Mohammad wrote the Arabic Quran with his right hand. The Arabic Quran says, whoever wrote those "Mishnah", "Gemarah" and those books of "What Jesus said, and What Jesus did", and "Hadith", "Sunna", Sharia Laws", and "Resalah" their hands should be cut off, and their hearts should be stopped. Allah be Glorified! By following from those fabricated fake books, people become fanatic and extremist. One of those who followed from "Mishnah" and "Gemarah" was a man called Menachem Begin. Few years back, this so called Jewish guy was living in Palestine with so called Muslims, the Arab people, in Peace. Then he gathered a group and started to terrorize people by plotting bombs all over the town. So finally he kicked its people out of their homes, which is against Allah's covenant, and then they captured some part of the Palestine in the name of religion, and called it "Israel". Thinking that there was a place called "Israel" and has to do with the religion. That was the wrong translation of "Children of Israel". That is why they call themselves, "Children of Israel". But, they are totally wrong, and misled by satan. As I mentioned "Bani Isra Eil" means "The Sons will be Transported by the All Powerful Allah". That is how they brought disasters upon themselves ever since, and as you know almost every day we hear some bad news from that part of the world. But if he would have followed the Torat, he would not have to kick those people out of their homes"! Then we have people following from those books of "What Jesus said", and "What Jesus did" they became so extremist and misled, that they really think our creator, provider, and protector is "E-saw" son of Maryam! This is unbelievable, although, they read in the En Jeal that they should not idolize any one besides the Almighty Allah, our only creator. Yet, they idolize him and they think he is going to come back and save them. This is against all Allah's scriptures even the En jeal. Here are some verses from the En jeal, which condemns idol worship: Jeremiah13:27, Isaiah1:29, Hosea12:11, Ezekiel23:49, 1Corinthians 5:11, Zechariah 13:2, Galatians 5:19, Isaiah 44:15, Isaiah 44:17, Exodus 32:8, 1Kings 15:13, 2Chronicles 15:16, 1Corinthians 8:7, Psalm 106:19, Psalm 24:4. Then we had fanatics who followed from those fabricated books made by human devil, and satan named: Hadith, Sunna, and Sharia Laws. One example was Ben Laden, who was duplicating from what Menachem Begin did; thinking that by terrorizing and bombing here and there, he could take over the world. That is why so called Muslims and Arabs brought disasters upon themselves by following from those books instead of the Arabic Quran, and by rejecting the Mathematical Signs in the Arabic Quran, ever since 1974. Disasters like, war resulting death in millions, revolution after revolutions, poverties, illiteracy, and they have been stamped with negative and ugly names like terrorists and vicious people. That is how these groups like, Isis, Boko haram, and the others have been coming out. People think so called Muslims read the Arabic Quran, and follow from the Quran! 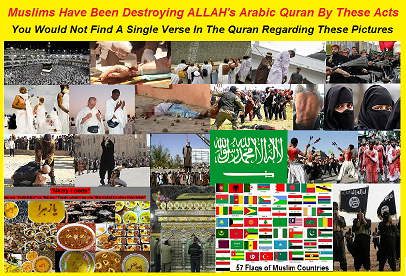 No, so called Muslims Do Not read from the Arabic Quran, they are only reading those fabricated books written by human devil, hadith, sunna, and sharia law and they are following them instead of the Arabic Quran. Just like so called Jews and Christians. Just go and ask them. Arabs Do Not read the Arabic Quran, that is why Allah warns, them that if they do not follow this book, "We will give it to people who are better looking", and that would be the American people! But, now satanic media have been trying so hard to ignore and deny the awesome mathematical signs in the Arabic Quran, and they are making people hate Allah, and His scientifically proven Quran, supported by mathematics, the exact science. Then we changed the language of those scriptures, and started to translate Allah's sacred words into different words for other people, thinking that now people can understand these scriptures better. Don't you think that the One Who gave us those scriptures new that? The reason is that those scriptures contain an especial knowledge called "Hikmah". Listen, when you go to school, you acquire "knowledge", but when you study the scriptures you acquire "Hikmah". There is no school that teaches you Hikmah, only Allah can teach you Hikmah. Yet, you cannot find any Hikmah in translated scriptures. Here is the reason why we should Not have done translating those scriptures: The older languages had different meanings for a single word, as you would find in Hebrew, Aramaic, and the Arabic dictionaries. Then Allah intervenes, and shows you the correct meaning for whomever He chooses. Because, He is the only teacher of His scriptures. This is a miraculous fact about Allah's system. Therefore, if you change those languages to the other language for other people, you would destroy this miraculous fact. Translators hide the Literary Excellence of the Arabic Ghor'on. How can one change Allah's sacred words? The Arabic Quran is so masterfully written, so brilliant, all the verses in a chapter rhyme, it is a perfect masterpiece. The Middle Eastern countries are so proud of their literature and poetry, especially E-rawnians, and believe it or not, it is all because of the Arabic Quran! That is how their culture and civilizations started to develop 1150 years ago. But, unfortunately they just learned poetry and literature from the Arabic Quran, instead of learning Allah's sacred words. And that only brought them unhappiness. Yet, translators bring their own version of the Quran. For more info you may go to the Quran translation. Here. The Arabic Quran is not like any other book written by human. Every time you read the Arabic Quran you would receive a new Hikmah from Allah, although you might have been reading it for 100s of times. Just like all of those Prophets reading those scriptures through all their life many hours days and nights. When you read a translation of those scriptures, you are only acquiring the knowledge was given to that particular translator. Another words, you are reading from a book besides Allah's scripture. And after a few times you can memorize it all, just like reading "Gone with the wind" after a few times. Therefore, you are letting the translator be your teacher, and your Elah, besides Allah, the Almighty. So Do Not waste your time on translations. Just translate the Arabic Quran for your own, and let Allah be your teacher. All you have to do is to learn the words used in the sura. We go to school at least 16 years, and we spend thousands of dollars in order to feed ourselves. Yet Allah teaches us the Arabic Quran for free, and He gives us the whole life time to learn it in order for us to be happy, and secure in here, and in the hereafter. The funny part is that every once in a while translators receives a new information, then they would go ahead and reprint another translation! . . But, this should be a lesson for them that they should Stop translating the Quran. As you notice again we were fooled by satan. That is why Allah repeated 10 times in the Arabic Quran that this book revealed to you in an "Arabic language". That means Do Not translate it, like what we have done with other scriptures. But, the translators reveal to us their own version of the Quran with the language of their choice! Always remember that Allah is the Teacher of the scriptures, and no one else. You must always remember that satan is the most ardent enemy of ours in this dimension as he was in the Garden before we came here, and he has a grudge against us. The consequence of those crimes mentioned above against our Almighty Allah, our Creator, and rejecting His only religion, "Submission" are disasters that we are facing every day, all around the world. Disasters like, floods, fires, earthquakes, tsunamis, tornados, bombings, economic problems, lack of securities, wars resulting so many deaths, revolutions after revolutions, poverties, homosexuality, millions of homeless men, and fatherless children, health issues because of poison chemicals that we are adding into our bodies, and food supplies, and so many other disasters. Do not let media fools you with those words like Nature, and Natural disasters. Allah is the Creator of the Nature. His anggels are the drivers of the wind, and they know exactly which houses or lives has to be taken away, and which ones to be saved. Unfortunately these are not going to be stopped. Unless we start worshiping Allah Alone, and following from His only religion, "Submission". This Temporary dwelling given to us by Allah, has rules and regulations. If we do not comply with our land Lord's rules, we are going to be evicted and pay penalty. And, He is the loving Allah and He gives us 40 years to make our decisions. But, people would not go backward in order to get their acts together. It is like we have burned our food, and instead of going back, and start from the scratch again, we have been adding spices into our burned food in order to make it taste a bit better. It seems like we are happy by eating the same old burned food. Let us all follow the Only Religion of Allah, "Submission" "The Nation of Ebrahim" in order to make this world a better place to live. "Submit To The Religion of Bani Esra Eel"
"Submit To The Children Who Would Be Transported By Allah"
"Submit To The Nation of Ebrahim"
Allah asked all of the Prophets to follow from the Religion of "Bani Esra Eel", "The Sons Who Would Bbe Transported By Allah", "The Nation of Ebrahim" which was described in all of those scriptures. That is why He asked them to follow Ebrahim. Now where was that message written? It was in those Scriptures given to the Prophets. Therefore, all of those scriptures contained the knowledge about how to follow from The Religion of "Bani Esra Eel", "The Sons Who Would Bbe Transported By Allah", "The Nation of Ebrahim"
Therefore, just worry about your own neck, and try to stay away from the crowed, religious leaders, and their millions of followers, because they would corrupt your brain. You Do Not want to be among the average people. You want to think clearly, and start your own study and research on the Arabic Quran. The Arabic Quran on this web site is the untouched message of Allah. Now we have an irrefutable scientifically proven Arabic Quran among all the other scriptures. Ask Allah to guide you to His right path, and ask Him for His Hikmah, and knowledge in the Arabic Quran. Just start by learning only one word a day. You have your whole life time to learn. Mohammad was receiving the Arabic Quran little by little during 23 years, so take your time. Do Not waste your time with translations. Ask Allah to teach you His Arabic Quran. In order to learn anything from the Arabic Quran you must have a pure heart, because the pages of the Arabic Quran made from purity. Therefore, only pure people can learn from it. You must be sincere. And you must read it constantly that is the meaning of the word "Quran", because we forget. Read it day and night. You have to ask Allah to help you with all of those characteristics; otherwise you would not be able to learn anything from this scripture. When you do that, then you would find yourself in a place that hardly any man has touched before. That is the ultimate happiness, which Allah calls it "Certainty", may Allah gives you more power. You may start by checking these videos on You Tube under the Title of "Ultimate Mathematics and Miracle 19 of the Quran- (Tape # ) or Religion Whistleblower. Or Count of initials in the Quran" and the name of the channel is "Creator's Revelations" so, or just search for "Religion Whistleblower" But, make sure Allah is the only One Who can help you, and teaches you. Here. If you ever decided to start reading Allah's Arabic Quran instead of John doe's Quran, you may click Here for the Arabic Quran, "The Arabic Quran order revelations After Prophet Mohammad", or Here "The Arabic Quran order revelations To Prophet Mohammad" in order to print the Arabic Quran. Believe it or not this is The only Corrected Arabic Quran in the Whole World, among all of those 50 different Arabic Qurans being printed in the world right now, which Allah blessed me for writing it down for this web site. Then get an Arabic dictionary, Al-Monjid, and also a book of "Index of the words of the Quran". Then start your own translation, Insha Allah.